Matilda Sissieretta Joyner (1869-1933) studied voice at the New England Conservatory. 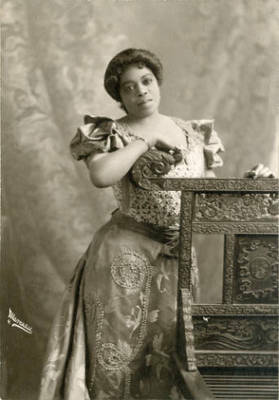 Known as “Black Patti” after an Italian fellow-soprano, she gave concerts in Saratoga Springs that attracted thousands, possibly including Burleigh, in August 1892 and 1894. The Daily Saratogian described the August 16 concert: “[A] great crush of people... began pouring into the park an hour before... the concert. Both entrances were used and the rush did not cease for an hour and one half. Every chair, bench or seat of any kind,... was taken and still sixty percent of the people stood during the entire program... [T]he pavilion... was surrounded on all sides by the crowd of between five and six thousand people who were attracted by the phenomenal singer they were anxious to hear.